Ammo Can Man's 50 Cal Ammo Can with locking hardware brings the added security element to an already superior storage container. 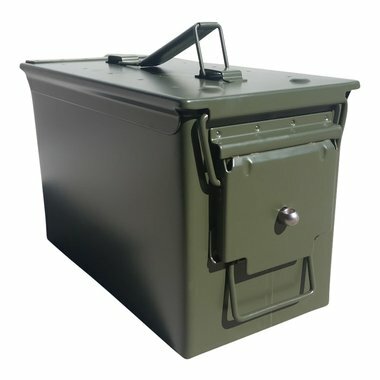 Protect the contents with this military grade ammo can made of steel and corrosion resistant paint with a water tight seal. Padlock hole: 0.25" dia, OD: 12"x6"x7.5" plus 0.5" locking hardware, ID: 11"x5.625"x6.875"